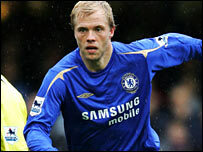 Chelsea striker Eidur Gudjohnsen has agreed a four-year deal at Barcelona after passing a medical on Wednesday. It is thought this season's La Liga and Champions League winners will pay in the region of £8m for a player that cost Chelsea £4m six years ago. Gudjohnsen scored a total of 86 goals in 263 Blues games - Gianfranco Zola is the only non-British player to have played more games for the club. But his chances of first-team action next season were limited. Barca were keen for a direct replacement for Henrik Larsson, who has left to play in his native Sweden next season. Barcelona, who clinched their second La Liga title in a row last month, have been on the trail of several strikers. But their attempts to land Arsenal's Thierry Henry and Diego Forlan of Villarreal were thwarted. Gudjohnsen told Barcelona's official website: "There were other big clubs interested in me but when Barca show their interest, it is not possible to say 'no'. "I now have to win the confidence of the coach and make it difficult for him to leave me out. "I was at a big team before at Chelsea and everyone needed to be motivated to succeed, and I have the same aim here."